Kororāreka was originally a Māori settlement. It became a base for European traders, whalers, and missionaries in the early 1800s. Many of these built houses and shops, and by the middle of the 1830s Kororāreka resembled a small town – New Zealand’s first. 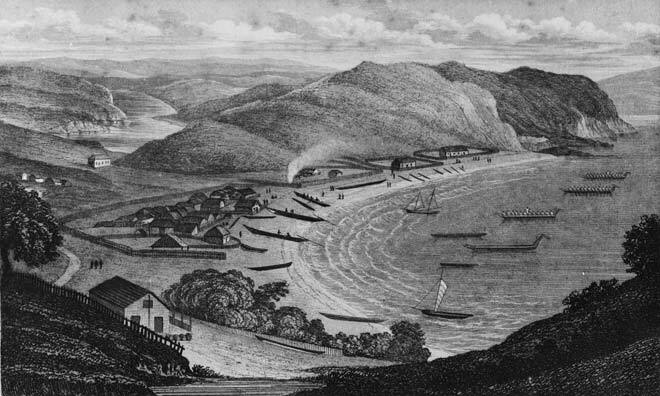 This view shows the settlement around 1836, with waka (canoes) and sailboats beached or lying offshore. By this time the settlement was dubbed the ‘hell-hole of the Pacific’, notorious for its drinking, fighting and prostitution. In the early 1840s the town changed its name to Russell.